In two days, all roads will lead to Koronadal City as more than 40 individuals have already signified attendance for CINEMATICA, a two-day workshop on photography, lighting and post-processing with facilitators from Manila- Cinematica masters Ku Manahan and Parc Cruz. CINEMATICA is open to photography professionals , amateurs, hobbyists, and enthusiasts who desire artistic growth by pursuing their passion for photography. Workshop registration is at Php 5,000.00 inclusive of lunch & snacks . Below is the course outline and requirements. 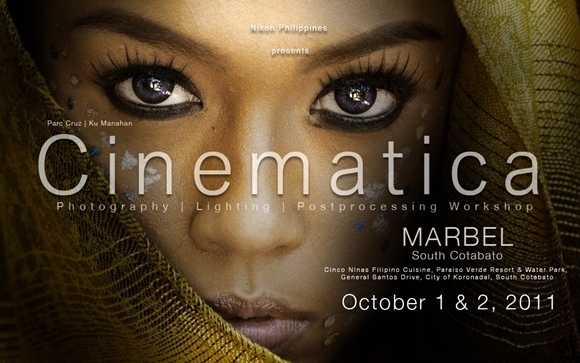 Cinematica will be held at Cinco Niñas Filipino Cuisine, Paraiso Verde Resort & Water Park, Gensan Drive, Koronadal City on October 1 &2, 2011. For registration and other details you may contact 0918-907-2278 or 0922-821-5014 or visit the event’s page on Facebook by clicking here.